I agree that if you're not actually going to enforce the rules, then plastering the train in stickers and signs is just a big waste of money that could be better spent on other things. I also have to agree with comments on other posts re: the fact that the quiet zone rules will mean nothing to the people who aren't quiet in the first place. They're not courteous enough to know that they ought to keep it down, so I doubt they'll pay any attention to the signs. In the meantime, I'm going to switch cars on the morning LSE express because I can't take another morning of a quad of 20-year-olds singing TV theme songs and half-yelling to each other about the One Direction concert. Today as people were exiting one of them actually said to the rest of the group "Everyone here hates us." You're probably right. And yet, you just keep doing what you're doing, because eff everyone else, right? Cool. And to think, those asses will be the first to complain when the kid is arrested. Probably saying it was the other guy's fault. Why take responsibilities for your actions, let alone your kids? 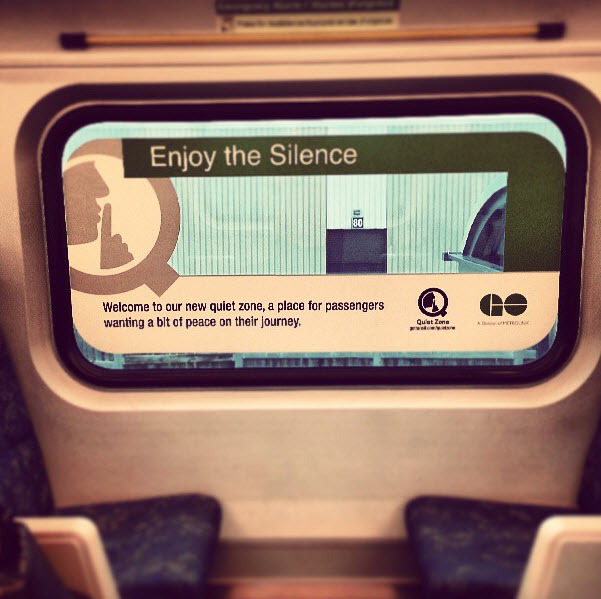 I do like the idea of Quiet Zones, especially going home at night. By that time of the day, all I want is to sit in peace and quiet and de-stress. My commute in the morning is pretty good, people are mainly quiet. But then again, it is 6.30 am. And if it let's me lash out at the idiot woman with a techno ring tone that takes her the entire min. to get it out of her bag, stare at it, decide to answer it - EVERY MORNING, then so be it. I think she has a kid calling. And when it calls at the same time every morning, you would think she would be prepared to answer it, n'est-ce pas? CSAs have the power to cancel the quiet zone at any time now. Which is good. Door Donkey's is too nice a name for them. Can we commence calling them "Door Douche Bags" or "Door f*cktards" or similar? I am looking forward to launch of the Quiet Zone on my line starting July 15. I might just even have a sign to no,d up like at golf tournaments 'Shhhhhhhh' / 'Be Quiet' or something else not so polite. Stories and comments like this is why I love this site so much! I feel like we're all secretly related. It's times like this that I miss taking the train in Japan. Talking on cellphones on trains and buses is a no-no (a friend learned that lesson the hard way!). There's even a 'manners' button on one's phone to turn off all sounds. And when Japanese have conversations amongst themselves while on a train, they don't shout at the top of their lungs because they might bother a fellow passenger! I would like the quiet zone to work, but as others have mentioned, unless it's enforce, it's meaningless. It's a damn share adults can't govern themselves accordingly, isn't it? "Children who show the finger to drivers turning on green lights as they run across a clearly marked red one." Statistically, evolution has a way of eventually taking care of this.